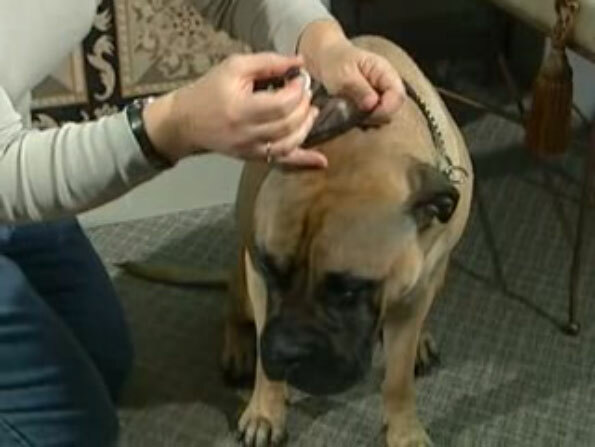 Many pets have had an ear infection at some point in their lives. Some pets seem to have chronic issues with their ears, which can range from uncomfortable to unbearable. While ear infections are most common in the spring and fall months, they can occur at any time of the year. It is also one of the most common reasons for pets to be brought into the clinic! The most common ear infection is the red inflamed ear with brown discharge. Infected ears can also contain yellow or black discharge, they may not even appear inflamed. Over time, the ear canals will become so inflamed that the opening towards the middle ear will narrow. It all depends on the organisms involved, the duration of the infection, and any underlying predisposing causes. How would I know if my pet has an ear infection? Scratching at the ears or shaking the head are some of the more common signs pets will show. Some animals may cry or whimper if their ears are touched, or not let their ears be touched at all. If your pet is showing any of these signs, we highly recommend they be brought into your Vet for the ears to be seen and evaluated. If an ear infection is not treated, the head shaking can lead to blood vessels rupturing in the ear, causing a hematoma (blood pocket) under the skin of the ear. These hematomas can require medication to surgical treatment for repair. It is always best to treat an ear infection as soon as possible. Some breeds of dogs seem to be prone to ear infections, especially breeds with large and floppy, and/or hairy ears such as Cocker Spaniels, poodles or sheepdogs. Ear infections can be caused by abnormal anatomy, an underactive thyroid gland, or allergies. The most common allergy to lead to an ear infection is a food allergy, though environmental allergies can also be a predisposing factor. Food allergies are typically reactions to specific proteins in food, (for example, chicken or beef) to which the body responds with sending out inflammatory cells. This causes the skin barrier in the ears to be abnormal, leaving gaps between the ear cells, allowing organisms such as bacteria and yeast to settle and replicate, causing infections. For dogs with chronic allergies, this abnormal skin cell barrier will need to be controlled, or the ear infections will continue to recur. What happens when I bring my pet to the vet? At the clinic, we examine the ears with an instrument called an otoscope. This allows us to see deep in the ear canal, in order to visualize the ear drum (tympanic membrane). Certain medications cannot be applied in the ear if the ear drum is perforated, so we need to visualize the ear drum to determine the appropriate medications for use. We also perform swabs of the ears, placed onto a microscope slide. After the slide is stained and visualized under the microscope, we will be able to determine the organisms involved in the ear, also aiding in selection of the most appropriate treatment. The ears are cleaned of debris at the clinic, and we demonstrate how to perform this procedure at home as well. If the ear canals are narrowed, or there is a predominantly bacterial infection, we may proceed with oral medication as well as topical medication in the ears. Recheck appointments are very important to ensure the ears are healing well and to determine if further treatments are necessary. Ear infections can change over time, sometimes needing changes in medications! While ear infections can be frustrating, the relief our animals feel when the infections have been treated is immense. Give us a call if your pet seems to be having any ear issues, we’re here to help.